Press Release – American Crocodile Education Sanctuary – August 20, 2011– At approximately 2:00 am this morning, Saturday, August 20, 2011, Mr. David Tuts of San Juan, Ambergris Caye, went for a swim in the lagoon area near his home where he was attacked by an American crocodile. Vince Rose of the American Crocodile Education Sanctuary (ACES) responded to the incident. Mr. Tuts’s sister informed Mr. Rose that David is an excellent diver and just decided to go for a swim. According to his sister the crocodile suddenly grabbed David by the head and pulled him under the water. Miraculously, David was able to grab a hold of the croc’s top and lower jaw and opened its mouth enough to get his head free, where he then swam to safety. He ran to his home one block away and was taken to Dr. Daniel Gonzalez for medical care. Due to the severity of his injuries David was flown to the KHMH in Belize City where he is reportedly in stable condition but being kept for observation in case of infection. David was extremely lucky and his fast thinking just may have saved his life. Although stable, David is still in a serious condition. Crocodiles’ mouths carry many bacteria that can cause serious infections. ACES was informed by a reliable source that the crocodile is a resident croc in the lagoon area between San Juan and The Boatyard and that local residents are in the habit of feeding it. According to crocodile experts, American crocodiles are intelligent apex predators and if fed, even one time by man, they learn to associate humans as a source of food. For the last several years ACES, the Belize Forest Department and The San Pedro Sun have been vigilante in educating island residents to the dangers of illegally feeding these predators. After years of research, scientists and professionals have ascertained that when humans feed crocodiles it changes the crocs natural behavior of fearing humans to not fearing humans. Thus, the fed crocs begin to associate humans with food and humans can in turn become food. Once an animal has been feed this association cannot be reversed. When crocodiles are illegally feed they become conditioned to associate man with food. 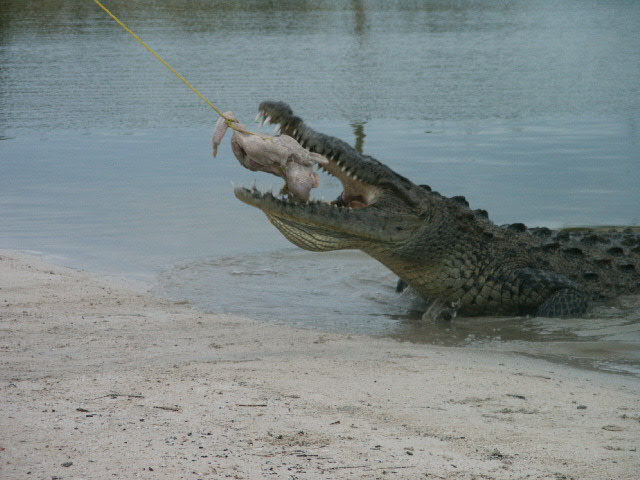 The ACES team has been capturing and relocating problem crocodiles for the last several years.